Snore Alarms, Do They Work? Are snore alarms an effective solution in the long term? Does behavioural conditioning work for snoring? Does a snore alarm treat the root cause or is it just a quick fix? Will most users find the snore alarm too annoying to stick to? Is snoring a voluntary action? How is a snore alarm supposed to work? The basis of a snore alarm is to introduce something unpleasant which makes you change your behaviour. This is a great example of negative reinforcement (or operant Skinnerian conditioning if you’re into psychology). Psychologist B.F. Skinner put a rat in a box which had a mild electric charge running through it. This rat ran around frantically until it found a lever that switched off the electricity, relieving it of its discomfort . Using this example, you are the rat and the snore alarm is the electricity; the only way you can stop this unpleasantness is to press the lever, i.e. stop snoring. This is where the model breaks down. Pressing a lever is controllable and voluntary. But is simply stopping snoring a voluntary action? Is snoring voluntary and can it be “learned” away? Snoring is often described as a habit . Using this reasoning, habits are behaviours, behaviours are learned and can be changed, therefore are voluntary. Or is it not that straight forward when it comes to snoring? Snoring is the result of involuntary soft tissue relaxation which can be exacerbated by voluntary lifestyle choices. Our waking habits concerning diet, exercise, alcohol, smoking and general health heavily influence our sleeping “habit” of snoring. Put simply, snoring is the symptom, not the cause. We don’t snore because we feel like doing so, but snore as a consequence of some things we can control. The best way to remedy something is to treat the root cause, something which in general, snore alarms don’t do. One thing is certain, snore alarms do stop snoring – at that instant. Unfortunately, this is probably because they stop sleep too. Over the years, a number of gadgets and devices have been created that give you an unpleasant prompt, and at that moment, they do stop your snoring . But this is because it disrupts your sleep so much that you stay in lighter sleep, or are even prevented from sleeping at all. Being awake is the best remedy for snoring! When considering using a snore alarm, remember why you want to stop snoring in the first place. Presumably it is so you and your partner can achieve better, healthier sleep. Are frequent awakenings really the best way to go about this? In trawling through the science of snoring prevention, we found only one article – written in 1983 with a tiny sample size of 3 people (!) – which reported that snorers had successfully “learned” to stop snoring after being exposed to a snoring alarm. These snorers were subjected to 7 nights of beeps that sounded when they snored which would only cease once they flicked a switch. On the eighth night with no alarm, their snoring was less compared to before the alarm therapy . The fact that this is the only evidence (not successfully replicated in the 36 years since) and that a sample size of 3 is hardly scientifically robust, makes us doubt the feasibility of treating snoring with an alarm. Over the last 50 or years, there have been a number of devices that never made it to the anti-snoring market that were designed to listen to snoring and alert their user. 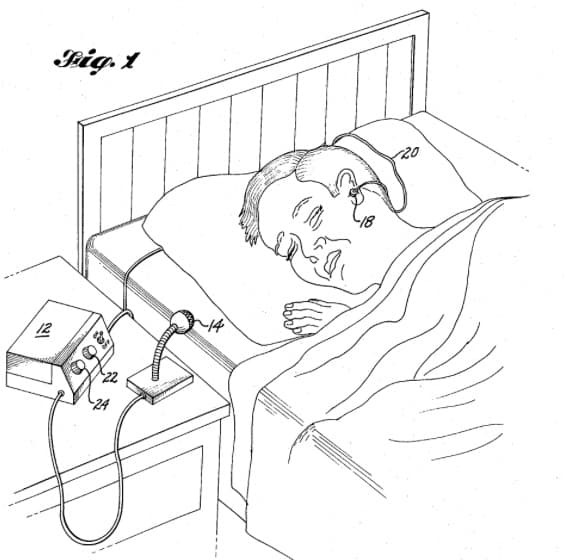 Initially, multiple inventors aimed to condition people by “imparting an electric shock to a sleeper when he snores of sufficient magnitude to awaken him, and ultimately, to condition the sleeper against snoring”. Needless to say, the idea didn’t catch on and rest assured, shock collars is not something we are considering at SnoreLab. 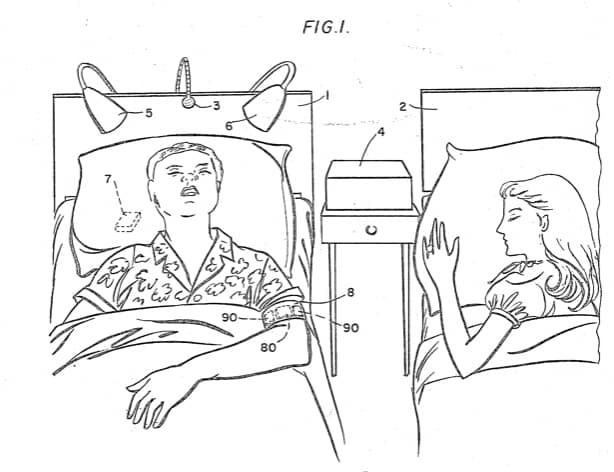 Another patent described itself as an “instructional device for snorers”. 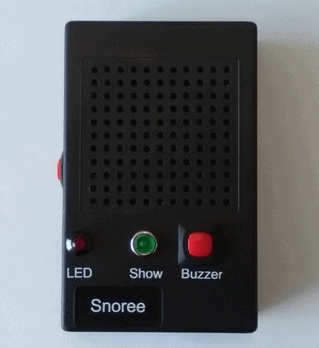 This gadget designed in 1970 used a microphone to listen for snoring much like SnoreLab does. It then used the snoring sounds to trigger a pre-recorded message which would play through an earpiece connected to the central receiver (something along the lines of “Oi you, stop that snoring now”). The expression on this snorer’s face tells you all you need to know about how good it was to sleep with this device from 1970! This struggled to gain traction as users became tangled in the wiring when turning over in their sleep. Though sleep therein was presumably not forthcoming after having disturbing messages played in their ear. 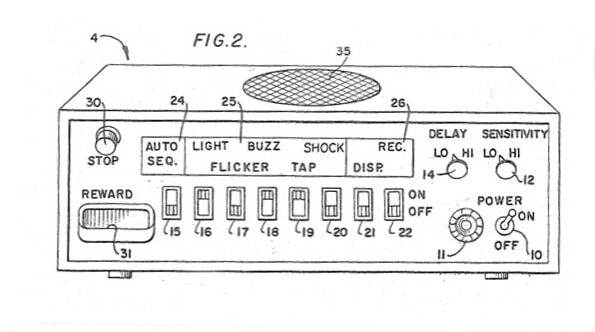 Improvements were made by other inventors in 1983 – realising that repeatedly waking the user wasn’t the best idea – with the creation of a wireless version that would “produce an irritating sound, enough to stimulate but not wake”. Products based on the same concept exist today. 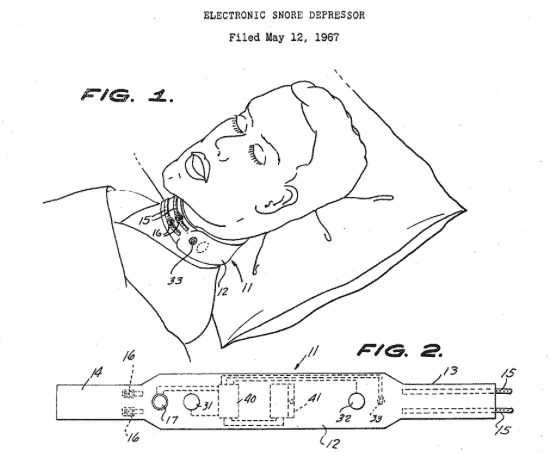 Other inventors went a step further and intentionally woke snorers with convoluted behavioural conditioning systems. This required snorers to actively shut off an unpleasant alarm – a choice of “intense beams of light projected at the sleeper’s head”, a pillow buzzer, a vibration, an electric shock or all of the above. It wasn’t all pain though. Once the snorer had successfully shut off the aversive stimulus, positive reinforcement would ensue and an M&M was dispensed via the “reward chute”! Never has the line between snoring human and lab rat been so blurred as with this bizarre blend of negative and positive reinforcement. We challenge any snorer to put up with this for more than one night! Snore alarms still exist, and there is a demand for them. And though they are very rarely recommended as a first line anti-snoring solution, some people swear by them. Still flying the flag for negative reinforcement is Snoree (though upon last check, the product wasn’t available), a Polish company who manufacture a buzzer which sounds when snoring is detected. Being hidden in the dusty corners of the internet with a dearth of customer reviews suggests that not many people find this device particularly useful. At SnoreLab, we even experimented on ourselves, triggering a flashing light when snoring was detected. This simply gave us horrible nightmares before waking us up in a state of utter confusion! Sound and light always have the unfortunate side effect of waking up a non-snoring partner too. So nowadays, most snore alarms work via vibration. Recent valiant attempts were made by some sleep monitoring apps using a connection to a smart watch. This would vibrate when the app detected snoring. It was much anticipated but ran for only two months before being hastily removed. This last line, “gently nudge him to roll over when he snored” is crucial. Here, the alarm wasn’t simply teaching him not to snore. It was treating the cause – sleeping position. This is when snore alarms CAN work. We don’t really think you can just learn to stop snoring. The evidence simply isn’t there. That is, unless you can learn to change the habit that makes you snore in the first place. Snore alarms can be useful if they, like in the aforementioned review, force you into making a change that influences your snoring, such as to your sleeping position. Positional trainers are atypical snore alarms in that they don’t react to your snoring per se. Instead, as the name suggests, they react to your sleeping position. 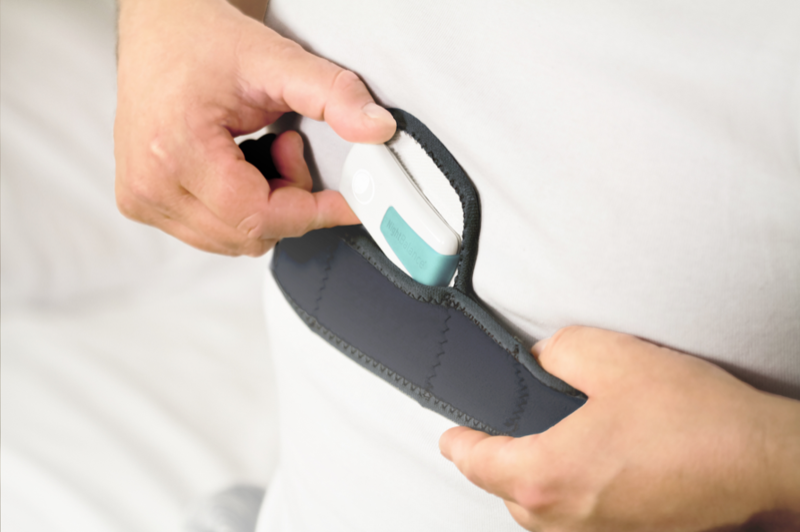 These small devices attach to your body (usually the chest) and vibrate when they detect that you are sleeping on your back. This does create a subconscious prompt for you to roll onto your side, and in time, you do it naturally. The evidence for their effectiveness is growing, showing promising results for mild obstructive sleep apnea with results even comparable to anti-snoring mouthpieces . 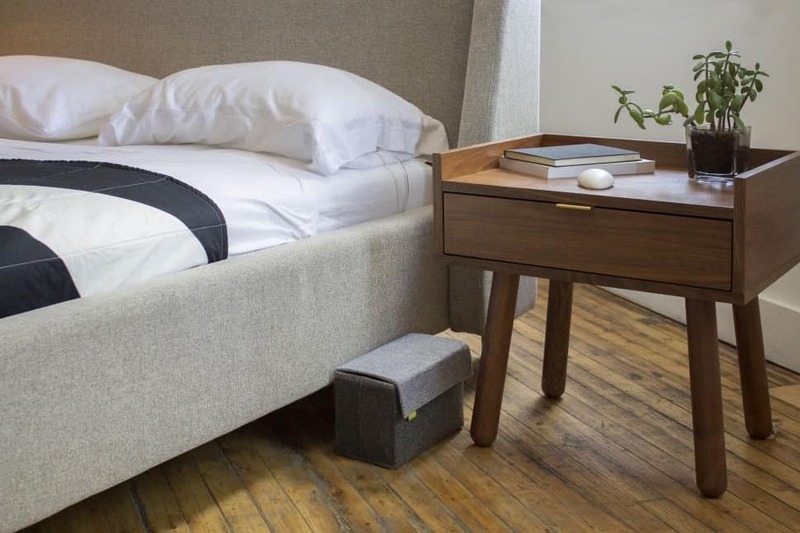 Another interesting snore alarm concept has been championed by Smart Nora, which listens for snoring and moves your head. Moving the head when snoring is detected isn’t a new idea. An inventor in 1963 came up with a system of microphones and plungers to shake and jolt a snorer’s head to wake them up. Thankfully, Smart Nora go for a subtler, gentler approach. Instead of intending to punish and wake the snorer to get them to “learn” to stop snoring, Smart Nora reacts to snoring by addressing its fundamental feature – a relaxed airway. When Smart Nora’s “pebble” unit detects snoring, it wirelessly sends information to the pump which inflates the expander under your pillow. This gently moves your head which brings back some much-needed muscular tone to your airways to nip snoring in the bud. Given the history and the evidence, we don’t think that snore alarms are the best way to address your snoring problems. The wisdom of yesteryear dictated that you can simply learn to stop snoring through behavioural conditioning. This is only true if the cause of your snoring is something in your behaviour – and importantly that can be instantly modified to good effect, i.e. sleeping position. Here, snore alarms can be extremely useful, the automated equivalent of a nudge in the ribs from a bed partner to get you to turn over. This is why we haven’t ruled out a SnoreLab snore alarm yet. However, in the vast majority of correspondence we’ve had with our users relating to their snoring, SnoreLab users don’t sleep on their back. In these cases, an alarm cannot address the underlying physiology that makes you snore. An alarm cannot train your allergies away or correct a deviated septum, it can’t make you lose weight or hold your tongue base out of your airway. 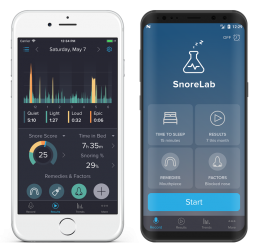 At SnoreLab, our aim has always been to treat the cause, not the snoring symptom, by giving you the insight into your triggers to better understand what the solutions may be. Skinner BF. The Behavior of Organisms: An Experimental Analysis. Oxford; Appleton-Century, 1938. Dilkes M, Adams A. Stop snoring the easy way and the real reasons you need to. London; Hachette, 2017. Fairbanks DNF, et al. Snoring and Sleep Apnea. Philadelphia; Lippincott Williams and Wilkins, 2000, p6.